Once known as Great Cow Harbor, the area that is now Northport grew from a rural farming and fishing village into an industrial hub. Shipyards dominated the harbor's shoreline, while brickworks and sand mines provided building materials for New York City's skyscrapers. As industry flourished, the community grew, and essential amenities for transit, education, and worship were established. During the 19th century, wealthy oyster barons converted seashell fortunes into publishing, banking, and real estate ventures, fashioning Northport into one of the prettiest villages on Long Island. Its harbor and beaches offered a summer refuge for city dwellers and a sanctuary for artists, actors, and writers. From bungalows along the coves to the magnificent Victorian houses along Bayview Avenue, Northport truly provides "Images of America." Teresa Reid is the curator for the Northport Historical Society. She writes a monthly history column about Northport called “The Society Page” for the Observer. Robert C. Hughes is the official historian for the town of Huntington, which includes the village of Northport. 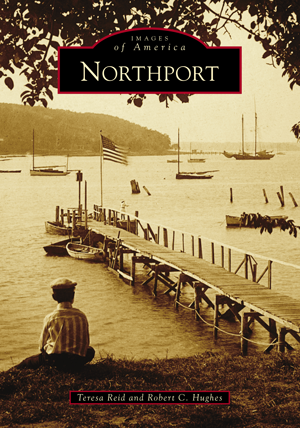 The Northport Historical Society’s treasure trove of images and research provided the foundation for this book.